The Sweden Democrats are now officially the largest political party in Sweden after polling 27.2 per cent in a survey conducted by Sentio. The result marks a new record for the anti-mass migration party who have seen a surge of support since the start of the migrant crisis, Nyheteridag reports. Political scientist Stig-Björn Ljunggren said he doubted the terror attack last Friday had a significant impact on the polling, saying it was unlikely that a large change in support would happen so quickly. The biggest losers in the poll were the Centre Party who lost 2.3 per cent, taking them below 10 per cent. The biggest rivals of the Sweden Democrats, the ruling Social Democrats, were down slightly less than a percentage point to 23.3 per cent. Prime Minister Stefan Löfven, who heads the Social Democrats, recently said the previous open borders policy toward migrants would end after the terror attack, a policy advocated by the Sweden Democrats many months prior. The raw data from the polling shows there may be even more support for the party than the numbers show. According to Sentio, who surveyed 1,001 people between 7-10 April, 29.6 per cent of respondents said they would vote for the Sweden Democrats if there were an election held today. 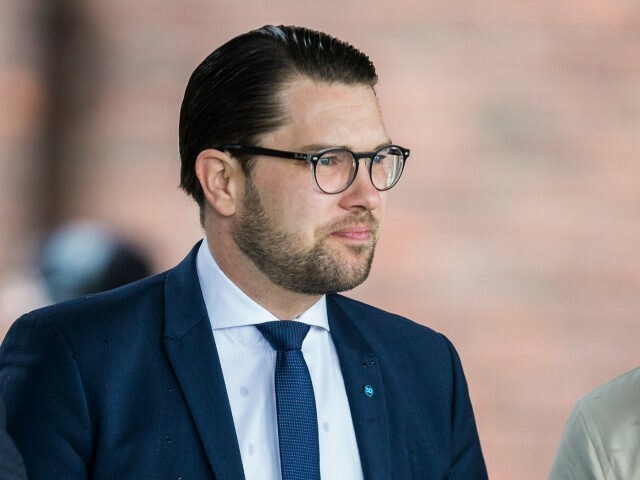 The leader of the Sweden Democrats, Jimmie Åkesson, spoke out about the attack Tuesday, commenting on the fact the attacker was a failed asylum seeker. “It is a massive scandal if it is so. We have seen how the number of internal border controls has fallen very sharply since the debate on the internal border raged a few years ago,” he said. Åkesson later wrote an opinion piece for newspaper Expressen demanding political consequences for the attack. Åkesson has been the leader of the Sweden Democrats since 2005 when he became the youngest leader in the party’s history at only 25. Mr. Åkesson has also been a fierce proponent of both Brexit and U.S. President Donald J. Trump. In an opinion piece for the Wall Street Journal, Åkesson wrote how Trump had been correct about the problems of mass migration in Sweden. “Mr Trump did not exaggerate Sweden’s current problems. If anything, he understated them,” he wrote.